Inner Sanctum of the Ninveah: Um... What? I didn't get on very much last night but when I did as Derranna I received an invite to a convo from Cap'n Sandi himself. Well, I was surprised (not that he knew of my alt but that he would bother to convo me at all) and curious as to what he had to say. I'll avoid the biting sarcasm about how he figured out how to use a locater agent to see I was in Providence 0.0 space (i.e. AY-YCU system), but for future reference, FINEG pilots, know that I assume you are aware of my location at all times, ok? I'm not surprised if you show up in local. Moving on. "Trying a POS in 0.0 eh? Hope you guys bring a carrier to defend this one!" "Hiding behind CVA's skirts in Providence won't save you." "Great, I don't have to worry about losing sec status now when I kill you." "Leave your corp behind to deal with us, eh?" "There are no missions to run in Providence you know." "You're going to have to run farther than that." "Unlike you, we are not afraid to follow people into 0.0"
"I heard AY-YCU is haunted... [...] Ghosts and goblins come out at night"
[ 2008.09.28 02:27:53 ] Capitan Santiago > too noob to do missiosn solo kirith? ﻿[ 2008.09.28 02:28:15 ] Capitan Santiago > or you just afraid ghosts might appear? 1. Cap'n Sandi is indeed 7 years old and thinks monsters hide under his bed and are in his closet. 2. Cap'n Sandi is an adult with a warped and odd sense of humour, and thus finds his threats the height of hilarity. 3. Cap'n Sandi is playing Eve while drunk and/or high, and thus finds his threats the height of hilarity. 4. Cap'n Sandi is just plain dumb. I suspect 2 or 3 are the strongest canidates. 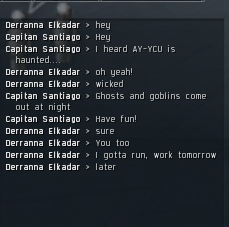 Regardless, that has to be the strangest convo I've had in Eve to date. the idiot (I refrain to call him captain) is an A$$hat. Period. he has gone out of his way to affect your game play and now he does not know what to do with you joining a corp. Well done. Never underestimate the power of stupid people in groups...that's the info I live by. TC and good luck. It never ceases to amaze me the lengths that people will go to to interfere with other people's games. I mean, seriously, people who devote all of their spare time trying to mess with someone who happened to be in a corp with someone who upset them? I guess that's what happens when you live in your parents' basement/attic. Oh this post just made my day. Did I scare ya? Just wanted to see if it worked. Nope, guess not. Next thing you know, your retarded "friend" will be summoning demons in Local if/when he ever actually shows up to engage. Highly entertaining post. Hahahaha, I think your response is the best part! I personally would have said that I already called Bill Murray, so ghosts aren't a problem. It's at least 2000% witty then what he said.